Medical Eyeglass Center offers a comprehensive range of services that are customized to your practice and patients, so you never have to sacrifice the vision you have for serving your patients. 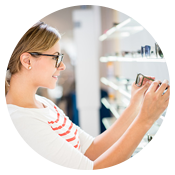 When you work with Medical Eyeglass Center, you gain access to leading experts in the field of optical dispensary management. Medical Eyeglass Center maximizes profits by improving aspects of your optical department, and each day we work hard to exceed your expectations as an Medical Eyeglass Center client. Medical Eyeglass Center is nationally recognized and locally focused which allows us to effectively tailor our strategy to the unique needs of your practice. Unlike other business management companies, we focus exclusively on the field of ophthalmology. Medical Eyeglass Center takes a multi-faceted approach to optical dispensary management, and we go above and beyond other consulting companies by partnering with optometry and ophthalmology practices to ensure long-term, sustained profit improvements. Medical Eyeglass Center is a leading optical consulting company that has helped practices like yours become profitable through our in-depth optical dispensary analysis services. To learn more about how Medical Eyeglass Center can help the optical department at your optician and ophthalmologist practice, visit our contact page to request a personalized consultation. You can also schedule a consultation by calling our office at (800) 455-0828.